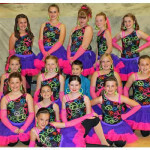 Step ‘N’ Time Dance Studio will present its 2013 dance recital “A Decade of Dance,” on May 31 and June 1 at the Whitehall High School auditorium. The shows will take place at 6:30 p.m. May 31 and at 12:30 p.m. and 6:30 p.m. on June 1. The studio is thrilled to be celebrating its 10th season, and bring back some of the best dances from the past 10 years. Tickets are $5 at the door, and doors open at 5:30 p.m. for both 6:30 p.m. shows. Doors will open at 11:30 a.m. for the 12:30 p.m. show on June 1. This year’s recital is sponsored by the Whitehall High School Class of 2015. Step ‘N’ Time Dance Studio is owned and operated by Gretta Nemcek Stanclift, a Whitehall native. The studio is in its 10th season, although it carries on the tradition of dance started by Angela Nichols, who opened the Nichols School of Dance in Whitehall more than 50 years ago.